at the February meeting, there was a Suzi Autos swift with a Chinese controller supposedly capable of regen, but with the regen disabled. I noted at the last minute before the meeting proper that the field seemed to be in series with the armature, but reversible. I remember wondering why you would want a reversing contactor on a car that has a gearbox including reverse gear. I also remember someone (sorry, I can't remember who) claiming that regen is impossible with a series DC motor. But maybe the two are connected: maybe this really is a series motor, and they use the reversing contactor for crude regen as well as actual reversing? After all, the reversing contactor is connected to the controller, so it could be reversing the field (when there is no motor current) as a preparation for regen. I assume it would be doing something like Otmar's regen page. Much of Otmar's problems were because the controller wouldn't quickly ramp up and down in duty cycle, since it wasn't designed for regen. But of course, the manufacturers could just incorporate it into their firmware. I assumed that the regen controllers came with separately excited motors, and indeed they do, according to Goombi's motor selection page. Maybe the manual for the two controllers is the same, and on the non-regen controllers, you just don't have the option of regen. For a while there, I thought perhaps they had figured out a way to do almost seamless regen on a series motor, using the reversing contactor. But now I think it's just a misunderstanding. Comments welcome. I believe that the controller in the Suzuki was a regen controller. From looking at Goombi's motor selection page, it talks about a separately excited motor and the drawings show the armature and fields being separate. Most series motors have separate terminals for armature and fields. Is there something different in the motor winding or the brush position? The only thing I can think of is that in regen the motor is configured into shunt mode, which would give some regen braking. I know from experience with my Solo Electra, When you over drive a permanent magnet motor while connect to the battery it will act as a generator and put charge back into the battery. Also from reading Goombi's web pages, I think the information has been written in another country and maybe in another language. Just had a rethink and reread of the info about the regen motor. I believe that the regen motor is in fact a shunt motor not a series motor. Was the motor in the Suzuki a series or shunt motor? If it is a series motor, that would explain the problem of the controller getting hot. I also read the motor has a duty cycle of only 1 hr. Last edited by Electron on Thu, 18 Feb 2010, 15:10, edited 1 time in total. Electron wrote: Was the motor in the Suzuki a series or shunt motor? I don't think they'd have needed the very large reversing contactors on a separately excited motor. The diagram showed the field in series with the armature (while being reversible), but of course there is no guarantee that that page happens to correspond to the car we were looking at. Last edited by coulomb on Thu, 18 Feb 2010, 17:25, edited 1 time in total. in general, a sepex motor will have much lighter field windings and more of them. 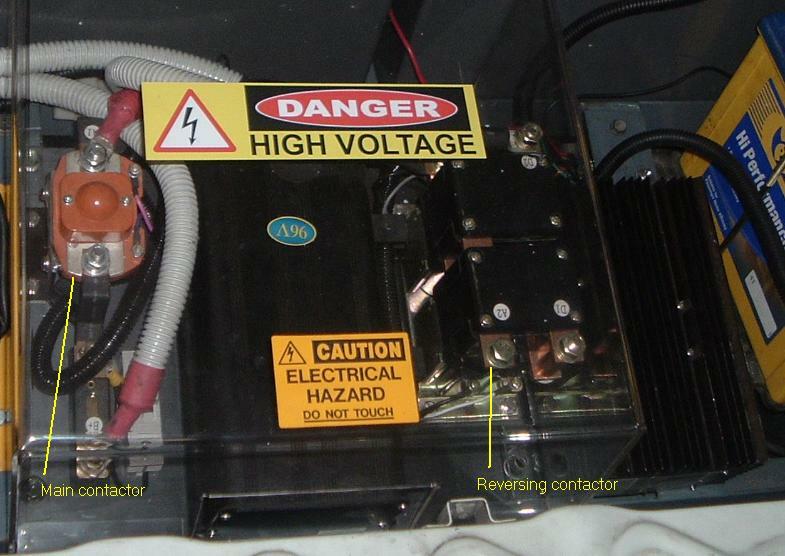 since little amps at traction voltage is easy to deal with, unlike big amps at low voltage. shunt motors are wired much the same as sep-ex motors (internally). that doesn't stop you from running a series motor with seperate excitation, though armature reaction does limit what you can do (especially if the motor has been advanced). those contactors may well have to switch under load if this is the case, and the user does not know how to utilise the setup. so they would need to be fairly highly rated. (even a kilovac EV200 is only rated to ~100 cycles at 100A 180v break). antiscab wrote: those contactors may well have to switch under load if this is the case, ... so they would need to be fairly highly rated. The reversing contactor is many times the size of the main contactor, and it higher (you can't really see in this photo) than the controller. It looks as though the top black conduited load goes to D2, but it's a trick of perspective; it actually goes to the 12 V auxiliary battery. Edit: Graeme did say that the reversing contactor "was just sitting there, unused". I assume he meant that it was only ever used in forward, never in reverse, so the controller was wired to always run forward. But maybe he means that D1 and D2 on the reversing contactor don't actually connect to the field of the motor. I sure wish I paid more attention now. Last edited by coulomb on Fri, 19 Feb 2010, 03:33, edited 1 time in total. Wow. Won't it be hard to make sure you get the field current just right? A bit off in the low direction, and you could draw massive current, and too high and you could attempt massive regen. With the armature across the pack, there would be nothing to limit the current, apart from fuses and the like. Last edited by coulomb on Fri, 19 Feb 2010, 04:02, edited 1 time in total. that wiring diagram would definately be for the series DC setup. they don't need terrific breaking capacity though, so open frame is fine. you could use the main contactor for connecting the battery to the armature (or even the reversing contactor). all just musing of course. still musing of course, but that is one possible way of wiring. No field, no back EMF, nothing to limit current, and armature across the pack. Or presumably you'd have interlocks to prevent this (e.g. at very low or zero field, make sure the main contactor supplying the armature is open). Of course, if you have access to the firmware source code and can reprogram it, you can make it natural (whatever that means for regen; there seems to be a standoff at present between the "must have coast" crowd and the "you'll prefer using only one foot once you get used to it" crowd). Last edited by coulomb on Fri, 19 Feb 2010, 10:56, edited 1 time in total. the reverse contactor was to be used if there was no gearbox, direct drive. As we use the original gearbox there was no point wiring it in, its there just in case the builder wishes to incorporate it. The motor is series not shunt.. . I hope I have answered your q's..
PS.. 2000 suzuki van is next conversion.. should be able to install larger batteries..
Last edited by suziauto on Mon, 08 Mar 2010, 03:52, edited 1 time in total. I might be wrong, but a standard series motor is not suitable for regen. There are 2 kits available, one is a series motor unit and other is a regen separately wound motor unit, the motors are different. How can you use a series motor with a regen controller, or a separately wound motor with a series controller? Last edited by Electron on Mon, 01 Mar 2010, 15:07, edited 1 time in total. Electron wrote: I might be wrong, but a standard series motor is not suitable for regen. It's widely regarded as unsuitable, yes. But it's been done. Yes, I realise that. But I thought Graeme said that this model was actually regen capable, and he chose to disable the regen. I think now I simply misunderstood; I think he meant that there is a choice of kits, as you say. I thought they had a milder form of regen available with clever use of the reversing contactor with a standard series motor and a standard series controller, with clever software. Separately, they offer "full" regen with the sepex controller and motor. As far as I know, it has a standard non-regen controller and series motor. Let's let this thread die; the clever thing that I thought might be happening clearly isn't. Last edited by coulomb on Mon, 01 Mar 2010, 18:45, edited 1 time in total. Could there be some confusion between regen and plug braking? 1. The motor is a separate excited DC motor, mainly comprising a stator, rotor, brush cover and drive cover and other components. There are also 2 different Controllers.